This is an another tasty and healthy Indian dish which is very familiar to Kannadigas (people belong to Karnataka, India). This dish is prepared in southern part of India where paddy is the main crop. 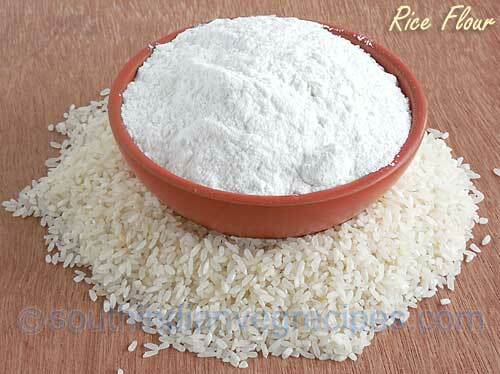 “Akki” is a Kannada word used for Rice. This is one type of roti (flat bread) prepared from akki hittu (rice flour) adding a little quantity of spices to it. You can serve this dish for breakfast and for lunch as main course as well. These rotis can be packed for lunch box and this dish is ideal for picnic as well. This dish can be prepared in different ways, I am showing you the simplest way of preparing this dish. This can be prepared instantly and takes minimum time to prepare. Let’s see how to prepare akki rotti. Pour cleaned akki hittu (rice flour) and salt in a mixing bowl. Place a sauce pan on stove. Pour 1/4th cup of water and jeera to it. Allow it to boil for 30 seconds. Pour boiling water over rice flour, mix it with spoon and close the bowl with lid. After 5 minutes, open the lid and mix rice flour with hands and start kneading the dough adding further a little bit of normal water ( as per requirement). Knead it thoroughly so that the dough should leave the surface of the bowl. Close the bowl with lid and leave the dough to set for 10 minutes. Take out the dough and knead it again with floured hands so that it will become soft and nonsticky. Devide it into small parts, make round balls by hands and keep them in a bowl, close the bowl with wet cloth or a lid. Place a tawa (griddle) on medium heat. Until it heats, you can start rolling the rotis. Take out one ball and dip it in dry wheat flour. Make it little flat by hands using palm and place it on a floured surface. Start rolling it in a circular manner. If you need you can apply some more dry flour on both the sides so that dough will not stick to the surface. Put the prepared roti on heated tawa, cook for 2-3 minutes on medium heat. Apply oil evenly on upper side of the roti, turn it upside down. Apply oil on the other side and cook for 2 minutes. Once again turn it upside down and cook it for 1 minute and take out the roti to a plate. You can check whether roti is fully cooked or not. Colour of roti will get changed little bit with brown spots on it. If you are health conscious, if you don’t want to use oil. You need not worry at all. You can prepare this dish without using oil as well. Take a small clean cloth, dip it in water and apply it on roti instead of oil for the first time on upper side of the roti on tawa. Turn the roti upside down and cook it with out applying water. Believe me it will come out very soft and tasty. Plane and hot akki rotti is ready to serve. You can serve it with red chilly chutney which I am going to tell you in my next blog post. Or you can serve it with any type of chutney. Isn’t it simple, try it once, you will love to do it again.